My greatest joy is being a wife to my high school sweetheart of 29 years and a mother to 2 wonderful girls. Once I decided to be a doula I discovered my third greatest joy in life, supporting and teaching other mothers as they give life to their new baby. When I'm not in a labor support room, I enjoy my garden, raising chickens, and fostering kittens. I attend births at all hospitals within the service locations. I attend births at all birth center births within service locations. Interview Meeting: I’m excited to meet with you in your home or over coffee at a convenient location to get to know your birth needs and how I can best serve you. I’m pleased to offer this free of charge. Moving Forward: Once you establish we are a good fit, I require a $500 deposit due at contract signing. The remaining $500 is due 2 weeks prior to estimated due date. I can discuss payment plans if needed. I accept cash or check. Birth Plan: Our second meeting focuses on your birth plan, how you imagine your experience, and outlining the most important elements to you. We will go through steps to ensure you understand your options and feel confident. Preparing: I am happy to offer stretches recommended by the Spinning Babies method, partner Rebozo scarf work, and calming techniques to help as you move into the more uncomfortable 3rd trimester. Labor: I'll be there for you before, during and after labor. I will arrive when you are ready, and provide you with at least three numbers to be able to contact me. When the time is right and you're ready, I will dismiss myself so you and your family can spend time together. Postpartum: I offer 1-2 postpartum visits depending on your needs and schedule. I will check in on you and baby within the first week after arriving home and again a few weeks after that. I will be happy to answer questions about breastfeeding and postpartum depression as well. *I’m happy to share my experiences with you and what my clients have found helpful in the past, but my advice should never replace that of a Medical Professional. If you think/feel you or your baby is in trouble please call 911. Not your usual Childbirth Class! This one of a kind pregnancy and child birth class will show you how to bring more balance to your body using movement and gravity. 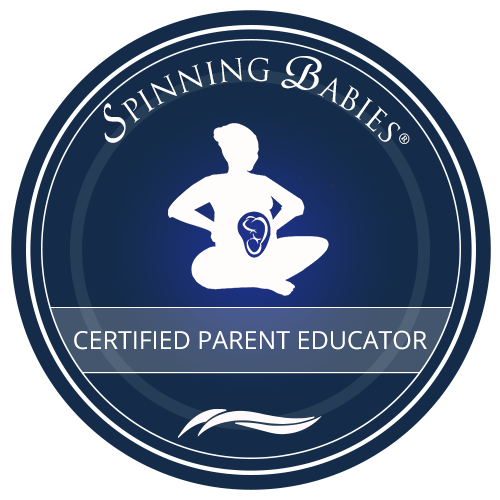 Certified Spinning Babies® Parent Educator, Kimberly Bergrud will help you understand more about what your baby does in the birthing process and specific ways you can help them have an easier birth! Class cost is per couple. Contact Kimberly below to schedule. "Kimberly was the most amazing and supportive person as my husband and I had our first child! From the first meeting with her we felt comfortable. She was incredibly easy to talk with and focused on understanding our needs during the birth process... my family and I could not of handled the birth process without the support of Kimberly. She is incredibly amazing and I plan to have her there when we decide to have another child." "One of the warmest and most genuine women I've had the pleasure of knowing and working with! ... she never left or acted inconvenienced by my long induction. ..She fed me ice chips between pushes and reminded me how strong and amazing I am! I will forever be grateful for her help those three days!" "Kimberly was right there coaching me and helping me get through the hardest thing I've ever had to do in my life. Having her there gave me comfort and confidence. Her personality, expertise and accessibility were fantastic. I really feel she was my lifeline and recommend her highly!" "Kimberly was there right by my side and I was still able to accomplish a part of the birth I wanted and for that I am eternally grateful and I would definitely recommend her to anyone I know that is pregnant, unless I'm pregnant and we're due near the same time, because I want her again." "Kimberly remained calm and talked to us through the whole process. She had a great deal of knowledge on how to use massage and different positions to alleviate some of the pain, as well as helping my wife get into a calmer state of mind...although she was volunteering, she devoted 100% of her attention to us and never left our side until sometime after the baby had arrived we settled in, total of 12+ hours. We cannot imagine a day without Kimberly support and highly recommend her!" "she never left us throughout the process. She was able to advise me on things and support me and aspects of the birth I had no idea about. She held my wife's hand during the entire process, offering positions that may reduce the pain, acting as an outlet for my wife to voice, and reducing Lea's worry and concerns... her kindness and support will never be forgotten." "She was able to keep my family calm. She knew what the next move was when no one else did. She was more than my 'doula' she was a family member."